← Transition Mount Hawthorn is born! The first Kitchen Gardeners meet of the year wasn’t about wasting any time. 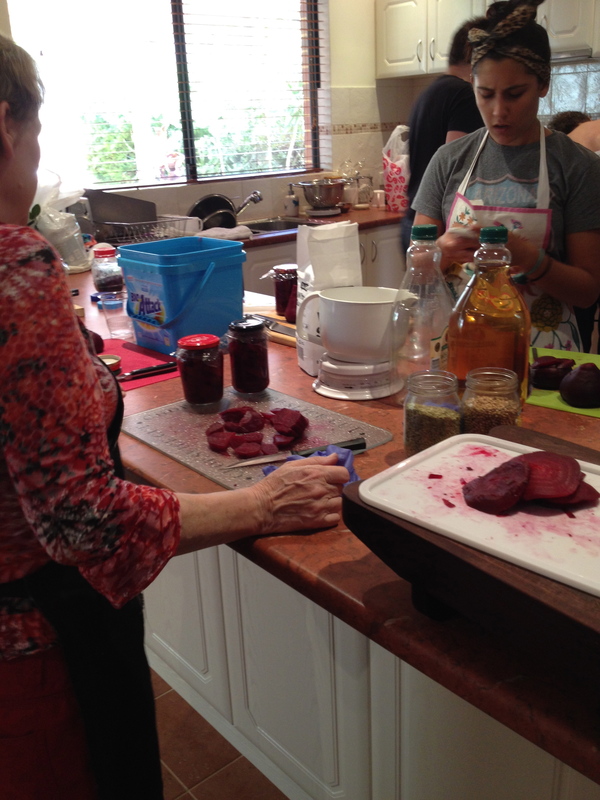 We got straight into it with a session on making jam and pickling beetroot. Thanks so much to Dave and Joan for offering their kitchen. Luckily, they are experienced jam-makers and picklers, because I’d underestimated the number of jars I’d need and Joan had a stash. Otherwise we’d’ve had a lot of beetroot to eat in a hurry! We all loved Amy’s apron – that’s her to the right of Joan. 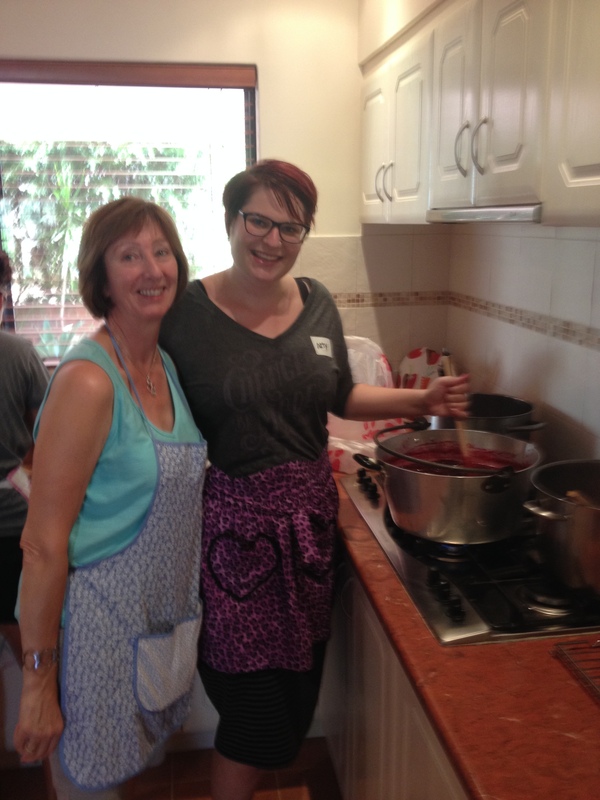 We used Elizabeth’s great-nana’s failsafe jam recipe and made blood plum and kiwifruit jam, which is agreeably tart and still sweet. As we used both of Elizabeth’s heavy stock pots to simmer out beetroot (more on that later), Joan offered her nana’s jam pot for our jam. What a beauty! We’re sure nana would have approved of our afternoon. Equal quantity by mass of sugar. Wash your fruit and cut it into equal-sized pieces, removing any stones, spots or yucky bits. Weigh an equal amount of sugar, mix your pectin through this and set it aside. At this point put your jars and lids in the oven at 100 deg to sterilise them. Put fruit in a large, heavy-bottomed pot on a very low heat. Let the fruit simmer very slowly until it is cooked. This step is important, as once you add your sugar the fruit doesn’t cook any further. Once the fruit is cooked, add your sugar and increase the heat to a rolling boil. Boil about 10 minutes, then start to test for setting point. Once your jam has reached setting point, take if off the heat. Let jam sit for 10 minutes or so, until the fruit no longer rises to the surface. This will ensure that when you bottle it, the chunks of fruit are evenly distributed through the jar. Stand back and feel pleased with yourself. Pectin is the naturally occurring acid in fruit that aids in setting. Slightly under-ripe fruit is best for jam as it tends to contain more pectin. I usually guess with the amount of Jam Setta I use, depending on the type of fruit and its degree of ripeness. It’s forgiving stuff. This recipe works for just about any soft fruit – the only failure I’ve ever had with it was with custard apple, and that was because it tends to be gritty. Setting point is the point at which the fruit soup changes its chemical consistency to a gel. To test setting point, put a saucer in the freezer. When the fruit has been boiling for 10 minutes or so, put a smear on the cold saucer, put it back in the freezer to cool down quickly, then run your finger gently through it. When the jam creases, it’s at setting point. You might need to do this a couple of times. If you leave it past this you end up with toffee. 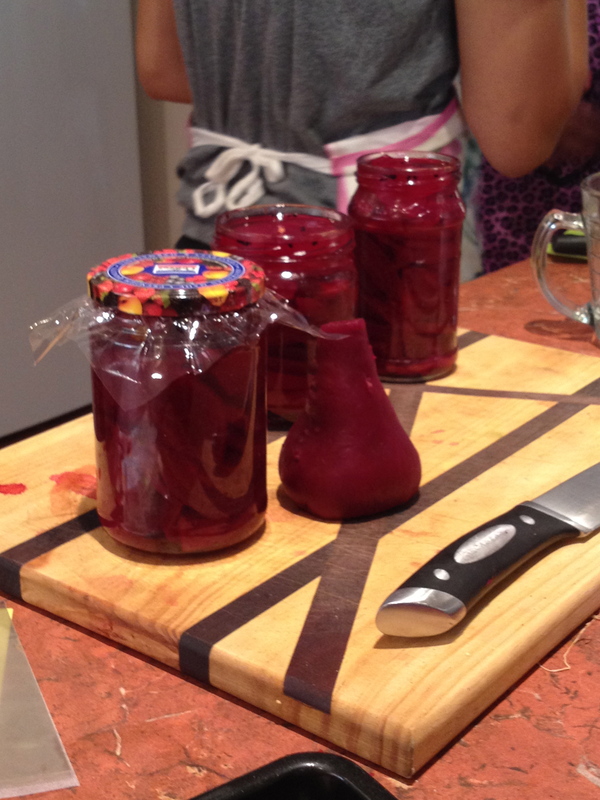 Then we pickled our beetroot. This recipe won Elizabeth an OTT rosette at last year’s Swan View Show. Wash the beetroot and place them in a saucepan. Add enough cold water to cover the beetroot. Bring to the boil and cook until the beetroot are tender. Drain beetroot reserving 1 and 1/4 cups (300ml) of the cookingliquid. Once the beetroot are cool, cut off the tops and bottoms and peel. Slice the beetroot and set aside. Mix together the reserved cooking liquid and the vinegar in a saucepan and bring to the boil. Add the bay, pepper, salt and sugar to the saucepan. Stir occasionally and bring to the boil again. Remove from the heat. Place beetroot slices in your jar and pour hot vinegar mixture over the top. dark cupboard for a few days before eating. This entry was posted in Food, Kitchen Gardeners, Uncategorized. Bookmark the permalink.